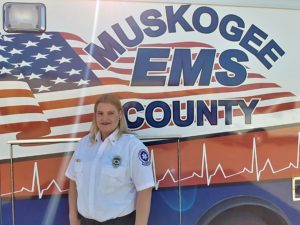 Kristen began her career at Muskogee County EMS in 2015 as an EMT. In 2016, Kristen earned her certification as an Advanced EMT and in 2017 she became a Field Training Officer. In 2017 while on a medical call, a shooting that was not related to her initial call occurred on scene. Kristen immediately triaged the scene to allow for the continued care and safety of her initial patient and partner while also locating the shooting victim and rendering care until another unit could arrive. This call is just one example of why Kristen is known for remaining calm under pressure and showing true leadership. Kristen did not hesitate to go to the aid of the victim even though it was an unsecured scene and her own personal safety was compromised. Kristen has always had a passion for helping others. She is selfless, hardworking and dedicated. She is always willing to work, whether she is putting in extra shifts, assisting with Public Relations events, or teaching a new employee. She is also known for her positive attitude and smile, no matter how busy her shift has been. In 2017 Kristen was voted by her peers as the the Advanced EMT of the Year. Kristen is admired by all who know her, most especially by her husband, Matthew. and her children Emma, Tuxie, Jacy, Alex, Caden and Addison. When off-duty, Kristen enjoys spending time with her family at sporting events and boating on the lake. Kristen also enjoys painting and playing with her dog, Lucy. Because of Kristen’s outstanding professionalism and her exemplary performance, Muskogee County EMS is honored to endorse Kristen Bias for the Oklahoma Ambulance Association Star of Life Award 2018. Kristen Bias is the Oklahoma Ambulance Association’s 2018 national Star of Life.